Another of our quality CNC accurate reproduction parts. 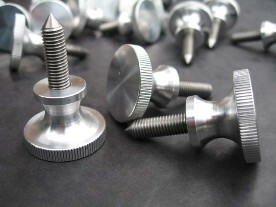 These are used with the rocker cover securing brackets that we also manufacture. Four cylinder engines (i.e. M, D, C and J as well as OHC Morris Minor) require 2 knobs per engine, with the F Type engine requiring 3. These knobs are coincidentally also used as the supercharger cowl securing knob for models C, J3, J4, K and generally any other models for cars which have been modified to take a blower cowl including P Types. The 5/16 BSF threaded stud section may however, require shortening depending upon your cowl arrangement. We also supply MG crested rocker cover knobs for the P, L, N, K, Q, KN and R Types.